November 18, 2010 (El Cajon) – El Cajon Historical Society invites the public to “A Knox House Christmas” at the Knox House Museum on Saturday, December 4 from 2-4 p.m. Handcrafted gifts, ornaments, textiles, period items, jams, jellies and bakery items will be offered for sale—along with free cider with purchase. 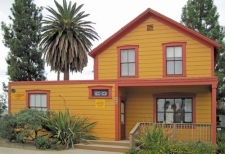 Knox House Museum is located at 280 N. Magnolia Avenue in El Cajon. Built in 1876, the building originally served as a hotel and residence for Amaziah Lord Knox and is the oldest commercial building in El Cajon. The site served as an overnight stopping place for gold miners en route to Julian and also served as a post office—with Knox as the first postmaster.